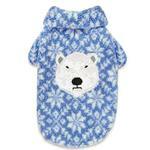 Dogs won't shy away from the flakes in this warm Zack and Zoey Elements Polar Bear Berber Dog Jacket! Sure to make your dog look stylish and keep them warm in the Zack and Zoey Elements Polar Bear Berber Dog Jacket. Beautiful snow flake design with a polar bear applique made of crushed velvet makes winter really heat up. Made of 100% polyester. 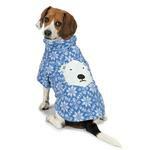 Fits my dog perfectly, is true to size, and is well made. Received great service, fast delivery and nicely packaged. I would highly recommend this item if anyone is considering purchasing this item. Love the color - a bit noisy. Posted On 03/17/18 by Korena S from Portland , OR Yes, Korena S recommends this product! I love the blues in this. It’s warm and fits great. 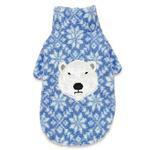 The only thing is that the polar bear is crinkly and makes a fair bit of noise when worn. Posted On 09/06/17 by Patty H from Nixa, MO Yes, Patty H recommends this product! This appears very large for a small. May never fit my Westie even when she's grown. But can go to my Chin if not. Can use for very cold weather. Posted On 01/05/17 by Mary J from Columbus, OH Yes, Mary J recommends this product! This coat is adorable and looks cute as heck on my Westie. It does run a bit large (size L) but I'm pretty sure a M would have been too small. Really, my only issue is with the inner lining, or lack thereof. I was hoping the inside of the coat would be the same soft fluffy berber as the outside but it isn't. To me (human) it feels rough and scratchy. Hopefully, it feels okay to Sid. In any event, since the coat is a little too big, I can put a thin, light fleece jacket on underneath. The coat is so darn cute it's worth the extra effort. Posted On 12/24/16 by Yolanda Z from Utica, NY Yes, Yolanda Z recommends this product!